Musical Fidelity EB-50 review | What Hi-Fi? We get excited when hi-fi companies decide to get in on the portable headphone action. In the last few years, we’ve seen some truly impressive efforts. Now it’s Musical Fidelity’s turn with the EB-50 headphones. 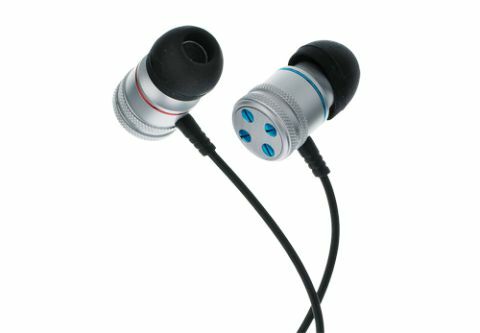 The company say it designed and developed the earphones from scratch, rather than choosing a design off the shelf, and it’s easy to see that it’s a Musical Fidelity product. The ‘military-spec’ aluminium body is in keeping with the firm’s hi-fi kit. We’re not sure about the screws on the back: they add to the industrial feel, but we feel they’re slightly unnecessary. We do like the colour coding, however. It’s a neat way to avoid having to look for a tiny L or R every time you want to use them. Travel down the 1.2m cable and you'll find a single-button mic unit, a very nice metal splitter and a flexible rubber cable tie, which is simple yet effective. In the box there are a variety of accessories, including a polishing cloth, a couple of adaptors (6.3mm, airplane) and a leatherette pouch. There is also a cord clip, ear hooks and ten pairs of ear tips, so you can find the perfect fit. Some of the review team found it difficult to achieve a good seal, but once we got there, we were treated to an open and spacious presentation. In terms of balance, we found that the EB-50s lean towards the top end. There’s a good amount of detail, but we occasionally found the treble to be a little brash. The midrange, meanwhile, is very smooth. Compared to the Beyerdynamic MMX 101 iEs, which cost £55 less, the EB-50s were missing a sense of subtlety and composure. For the money, we’d like a greater sense of refinement. The Musical Fidelity EB-50s are very competent headphones – we just don’t feel that their price matches their performance.